My name is Steven Biro. I trust you will bear with me for the next sixty minutes. Feel free to interrupt with questions or comments any time. The title of this presentation is “FUNDAMENTALS OF ANALOG/DIGITAL OVER-THE-AIR TV RECEPTION”, a subject not very frequently discussed and analyzed these days. As a matter of fact, over the past ten years, there have hardly been any articles dealing with over-the-air TV reception. Co-location of Analog and DTV Stations. Back in the sixties, the identification of the desired TV broadcast stations and potential co-channel interference sources required many hours spent over large maps, then searching the TV Factbook, manual calculations, direction identification with a protractor, and other time-consuming activities. Most of the time the search was limited to 50 or 75 mile radius, seldom extending 125 miles. Usually the results were less than complete, and the accuracy depended on the engineer’s attention and experience. These days computer-aided reception studies deliver enormous amount of technical information, precise distance and direction calculations, while the search radius is practically unlimited. Two major products of these studies are: The Computer Run and the Signal Direction Sheet. The El Dorado, Arkansas computer run, shown below, displays all analog and DTV stations within 75 miles of the proposed site. The stations are listed in logical, increased distance order. These are great circle distances, as electromagnetic waves propagate, not highway miles. Computer calculated great circle distances are accurate within 0.01 miles and the azimuth angle accuracy is better than 0.1 degree. Observe the output power variations. A few analog UHF stations operate with 3000 kW or higher output. At the other end of the spectrum the output power of Channel 38, KMCT-DTV, West Monroe is limited to 50 kW. The carriage of this station will reqire special attention. Note the changes in transmit antenna heights. Channel 27, KTVT-DT, Monroe operates from a 1909 ft high tower, while Channel 25, KLTS-DT, Shreveport is limited to a height of 828 ft. Since the received signal level is a function of output power and transmit antenna height close attention must be given to these changing technical parameters. Perhaps the most interesting observation is the channel allocation of certain Digital TV affiliates. In case of Channel 39, KMCT, West Monroe, its digital affiliate operates on adjacent Channel 38. The same characteristic applies to Channel 24, KLTS, Shreveport, and Channel 33, KMSS, Shreveport. Will the original analog antenna designated to receive Channel 39 pick up the Channel 38 digital transmission? Most likely it will, thus reducing the number of new antennas for DTV carriage, if you have the right information. Computer runs also have tremendous flexibility. The El Dorado coverage radius is not limited to 75 miles. It can be easily extended to 100 or 125 miles, or beyond. Display limited to UHF stations. The purpose of the computer developed SIGNAL DIRECTION SHEETS is not to promote artistic quality or advances in computer science. Signal Direction Sheets present the Computer Run’s technical information in a convenient, visual format, helping the search for co-located stations, assisting the survey engineer during the on-site verification testing. The search for the desired and undesired (interfering) stations will be performed faster and with much greater accuracy. The El Dorado, Arkansas Signal Direction Sheet, prepared for the proposed antenna site, presents all analog and Digital TV VHF and UHF stations in a 75 mile radius. 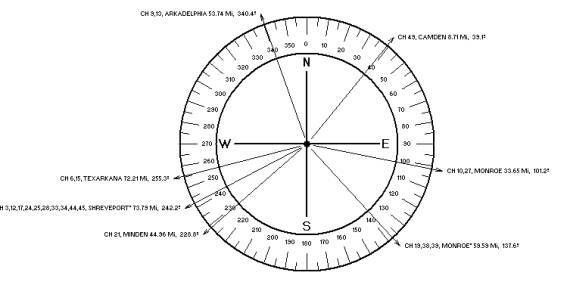 The Signal Direction Sheet clearly demonstrates that the MONROE TV stations are received from two different directions, 37 degrees apart. On the other hand the Shreveport analog and Digital TV, VHF and UHF stations arrive from the same direction. All five (5) Shreveport DTV stations are co-located and theoretically should be received by the same UHF antenna. A prime example is the Signal Direction Sheet below, developed for the El Dorado, Arkansas head-end, limited to DTV stations. When conducting a DTV reception survey, and the engineer has a special Signal Direction Sheet on hand, the search or rotor-mounted test antenna has to be turned around only once without missing any of the desired stations. Co-channel interference is the prominent interference problem when receiving distant analog TV stations. In the olden days the co-channel interference search was done manually. A very involved and highly inaccurate process. Computer developed co-channel interference studies, prepared for any desired VHF or UHF channel, present a large amount of essential and precise information, in a convenient tabulated format. The Channel 3 co-channel interference Computer Run below, developed for the El Dorado, Ar. head-end, lists all possible offenders within a 225 mile radius. 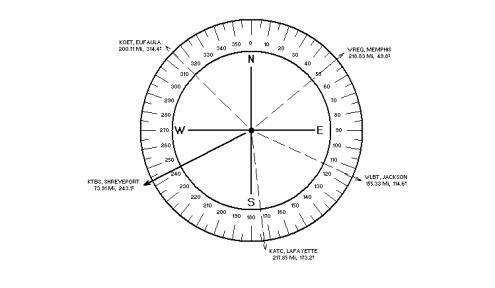 The reception of the desired station, Channel 3, Shreveport, from a distance of 73.91 miles, was feasible because of the extremely high transmit antenna (1781 ft), compensating for the great over-the-horizon distance. The closest co-channel offender, Jackson, Mississippi has an unusually high (2050 ft) transmit antenna. A steady, high level co-channel interference was expected from this co-channel offender even without an on-site verification survey. One of the most important information is the frequency offset of the stations, permitting the positive identification of the offender with the aid of a spectrum analyzer. (To be discussed later in greater details). The co-channel interference information was also developed in visual format, demonstrating the variation in the directions of the possible interference sources. The display clearly shows that the four possible co-channel offenders arrive from four drastically different directions. By orienting the tower mounted search antenna into those directions, and observing the rise and decline of the ±10 kHz or ±20 kHz offset beats on the screen of the analyzer, the primary interference source could be positively identified. In Part 2 of this paper, High Definition TV reception problems, and the best tools for interference elimination will be discussed in greater details.